Discover your strengths, weaknesses, where you stand in various areas of your business that include: Finance, Operations, Sales, Marketing, Services, Competition, Management, and more!!. You will receive suggestions and helpful tips to your specific problems that are uncovered and enable you to identify issues, adjust course and build your business on solid ground. 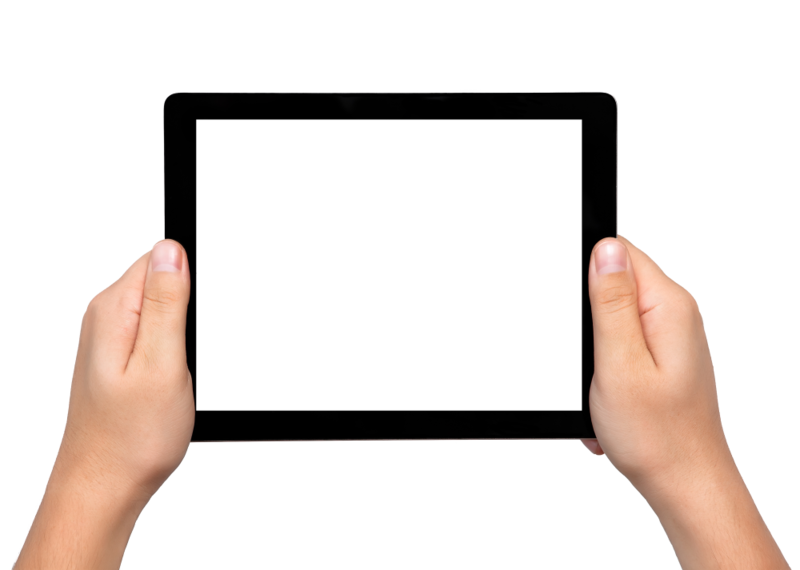 This simple, yet powerful business tool will give you what you need in no time. 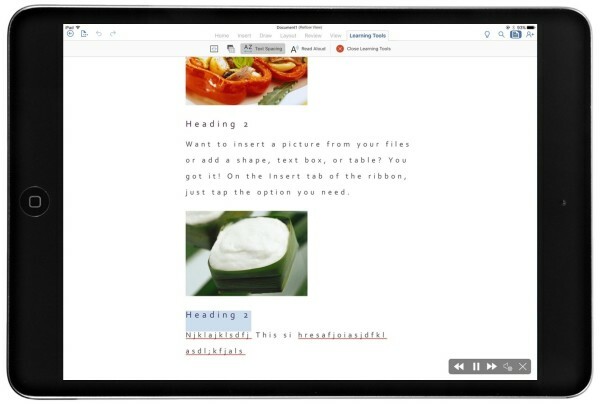 This is more than just a typical assessment tool. The scorecard combines quantitative and qualitative criteria. This simply means we take soft data, (example: customer satisfaction) and “hard” data (example: financials) to figure out where you are and where you should be. The scorecard is your end result. 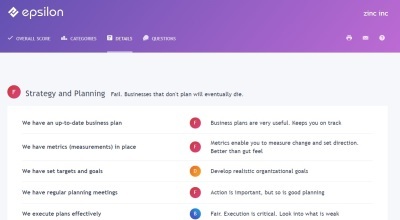 Once you know what areas you need to improve, and implement your plan, your scorecard is there to show you whether you’re on the right track! 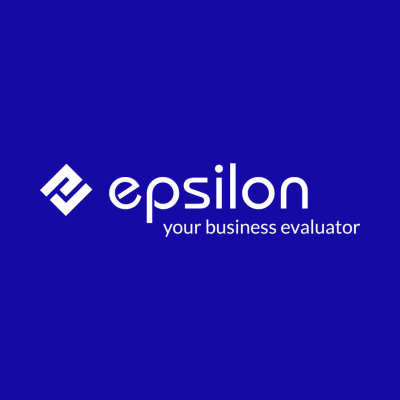 Epsilon - Your Business Evaluator gives you a high level report with suggestions and solutions, for each category. These tips are not meant to be conclusive, but are meant to provide direction. This report provides you a framework for building your strategic plan. 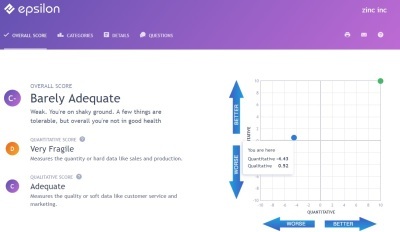 Since you have identified the weak areas in your graphs, the detailed report will give you some advice on what needs to be worked on, which will help you fill in the blanks when it comes to your growth plan . Graphs provide great value. They are visuals that can help assess business performance, and helps you to recognize patterns or trends. 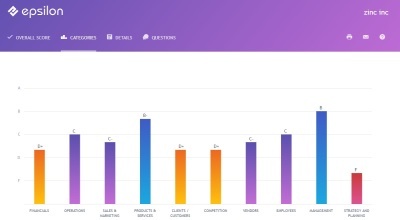 By reviewing each graph in each category and evaluating your business every quarter, you are able to monitor your progress and identify patterns and problem areas. Look for your weak areas first. You want to tackle these problem areas before they become serious. Focus on improving these areas. As business owners, we tend to do things on our own due to limited resources.